While domestic car maker Tata Motors was yet to disclose the price of its upcoming SUV Hexa slated for launch during this month, some sources of have leaded the prices of vehicle ahead of its launch on the official website of company. The price leaked have also been confirmed by one the dealers. According to emerging reports the price of Hexa will start from Rs. 12.30 lakh for the base variant and will go high to Rs. 19 lakh for the top end variant. Both the prices are ex-showroom prices for Coimbatore. Under the bonnet it will be empowered with 2.2 litre turbo diesel engine boosting the power of 150 PS and torque of 320Nm and mated with five speed manual transmission system. This power generation efficiency will however be restricted only in the base variant, the remaining higher trims will be capable for generating the power of 156 PS and torque of 400Nm and mated with transmission option of six speed manual and automatic transmission system. There will be overall nine trims of which some of the trims might get even the option of 4.x4 drive. Inside the cabin you will find spacious cabin with some premium features like Harman touchscreen infotainment system. 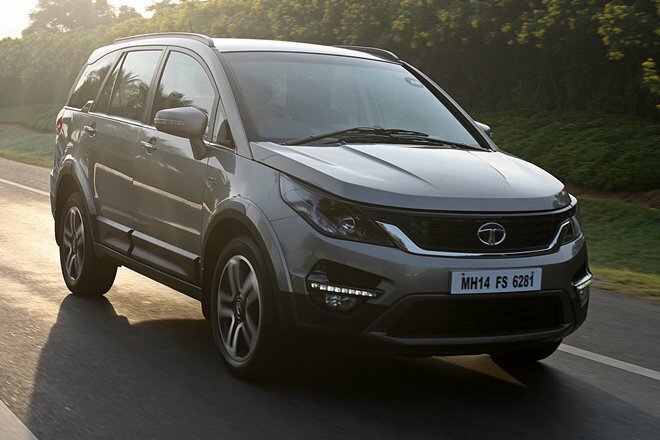 It is reported that to compete with Toyota Innova Crysta, Tata will also offer interior kits separately for Hexa, facilitating the buyers to customize it according to their requirements. The sale of kits will however raise the price of SUV and on-road it might cost around 22 lakh to the buyers.